A while ago, Pingdom published a report on the availability of online storage services, showing how often they were offline. For any such service on the internet, availability is a very important factor. 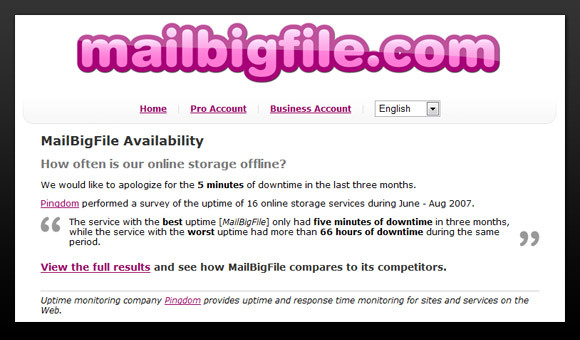 The service that scored best in the test was MailBigFile. They have capitalized on the value of having independent third-party information that confirms the quality of their website uptime, so they have posted a special page about the Pingdom report on their own homepage. We would like to apologize for the 5 minutes of downtime in the last three months. Independent data adds credibility. That is true for almost anything, and uptime monitoring in particular. This was a special report from Pingdom that we published in our blog, but we have plenty of customers, for example web hosting companies, who use public report pages generated by Pingdom to show their own availability to their users (this is easily set up using website monitoring service).